Augmented Reality Twitter App Looks Awesome. Hope Apple Thinks So Too. So this a little bit old, but we’re just seeing it after Twitter’s chief scientist Abdur Chowdhury (who came over in the Summize acquisition last year) tweeted about it last week. Check out the video at the bottom of this post for TwittARound, a new augmented reality Twitter app for the iPhone 3GS. It looks pretty damn slick. While there are no shortage of Twitter iPhone apps out there, this one is different because it uses a combination of the device’s camera and the iPhone 3GS’s compass feature. Basically, you fire up the app and it opens your device’s camera lens, allowing you to see whatever you’re pointing the device at. 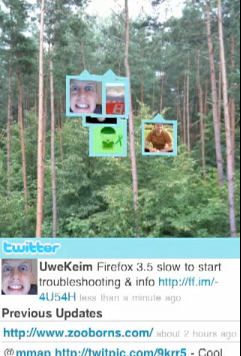 Overlaid on this live image are icons of Twitter users to show those in close proximity to you who are tweeting. And below the camera is a Twitter feed of those people’s updates. But what’s really cool is that when you move the iPhone around, the compass recognizes you’re turning and loads new tweets based on the direction you’re pointed in. It also shows how far away those people are. After writing some native iPhone apps this Webkit approach seems to be ideal for rapid development of applications independent of the iPhone UI. That sounds like something Google might say. But there’s a potential hiccup with this: Apple . Technically, using the open camera lens (basically, live video) as your background apparently only semi-conforms to the iPhone SDK. But there’s a petition from a bunch of developers making AR apps, for Apple to fully support this.